Aim of this Study is to determine the most important limiting factors at the treeline afforestations on Vitosha Mountain. 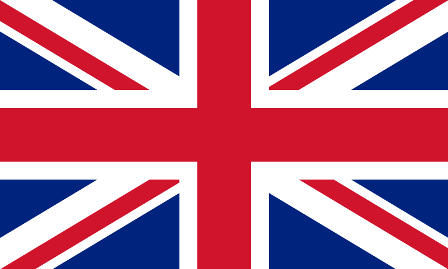 It is a part of the PhD study of Eng. Momchil Panayotov. The study site in Vitosha mountain is nearby Aleko hut at the end of the wide plateau, on which is situated “Torfeno braniste” reserve. 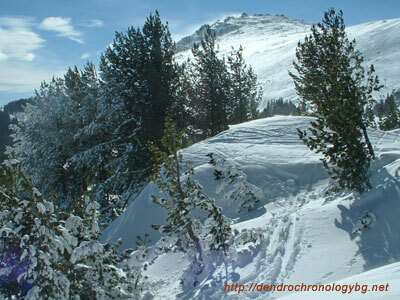 About sixty years ago in this region there have been carried out plantings with Macedonian pine (Pinus peuce Griseb. ), Norway spruce (Picea abies Karst. ), Scots pine (Pinus sylvestris L.) and limited number of mountain pine (Pinus mugo Turra ssp. mugo ) and Bosnian pine (Pinus heldreichii Christ). The trees have experienced strong influence from winds, snow drift, rhyme accumulation and occasionally ice accumulation during freezing rains. At the present moment there are big differences in the condition of the trees from the separate species and from one and the same species, but found on micro sites with different growth conditions. This provides the opportunity to study their reactions to disturbances and compare their resistibility. Three permanent and three temporary plots have been marked in the region. Three of them are in plantings of Macedonian pine (Pinus peuce Griseb. ), two in plantings of Scots pine (Pinus sylvestris L.), one in a natural forest of Norway spruce (Picea abies Karst.). Position of permanent Pinus peuce plots (N1 and N2), temprorary Pinus peuce plot (N3) and permanent Pinus sylvestris plot (N4). The rest of the plots are in the forest beyond the visible ridge. 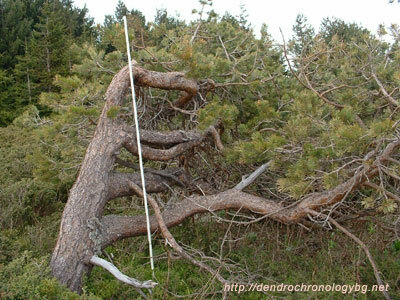 In the plots have been made measurements of H, Dbh, Crown dimensions and extracted cores for Dendroecological analysis. In two of them (treeline plots N1 and N2) have been recorded coordinates of the trees and composed digital maps with the use of ArcGIS 8.3 Software. At the present moment the state of almost all Scots pine trees is very bad. They have flagged crowns, skewed stems with numerous breakages and slow growth. 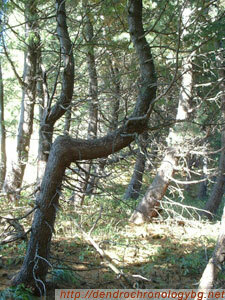 The state of Macedonian pine plantings is normal, but there are zones at about 20m behind the edge of the plantings with strongly deformed trees. Snow measurements during the winters of 2004 and 2005 show that there are huge accumulations of snow in this zone. 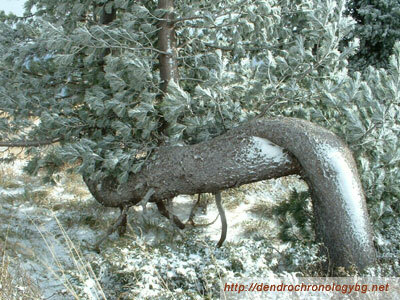 Dendroecological analysis shows a strong relation of stems damages periods with winters with higher than normal snow accumulations. The state of Norway spruce trees is observed in natural forest groups. As a species, that naturally forms treeline in Vitosha Mountain, Picea abies is well adapted for local conditions and together with Macedonian pine regenerates successfully. Although there are a limited number of Bosnian pine (Pinus heldreichii Christ) trees gathered in small groups, they are also object of interest. In Vitosha mountain this species does not grow on its preferred calcareous soils, but it performs very well and the initial observations show that it suffers only from occasional desiccation. Stems have normal forms, heights and diameters. Results from this work have been presented on the 4-th Tree Rings in Archaeology, Climatology and Ecology (TRACE) conference, held from 21 to 23 of Apil 2005 in Fribourg, Switzerland and on the “Young Scientist” Conference, held from 17 to 18 of May 2005 in Sofia.